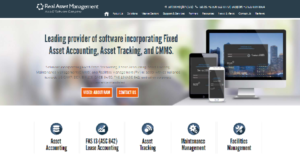 Asset4000 is a comprehensive asset management suite that comprises of several software systems each designed to cover specific aspects of asset management, including fixed asset accounting, lease accounting, asset tracking, maintenance management, and facilities management. With Asset4000, companies are able to closely manage all their assets, equipment, facilities, and more from a single platform. Monitoring their lifecycle and depreciation is a breeze. The software suite provides them with tools so they remain compliant. The software allows for effortless tracking of their daily operations and audits as well as managing their maintenance schedules to drastically optimize their performance and lengthen their service lives while driving down costs. Simply put, Asset4000 ensures that users are able to fully utilize all their assets from acquisition to retirement, adhere to compliance standards, and easily audit each asset with full confidence. Asset4000 has everything you want and need in an asset management software, It lets you control, monitor, and document all changes that happen during an asset’s lifetime with ease. This includes asset status, history, and location. The software supports various depreciation methods and gives you a full audit history whenever you need it, along with integrated asset tracking with or without barcodes. Asset4000 is not a complicated software. The browser functions as a comprehensive search engine. A quick search and you can access all the system features. You have total control over the definitions of fields, description lines, and validated pick lists. This allows for quick and effortless data entry and helps reduce errors, if not eliminate them. You can easily attach pictures, documents, purchase orders, and hyperlinks to assets. You have the option to implement Asset4000 on the cloud (Full Hosting and Management) or deploy the software locally within your network. Asset4000 comes with a plethora or tax-related tools to help you process, complete, and submit tax documents quickly, easily, and accurately within a single database. You no longer have to rely on a CPA firm to manage all your tax and financial requirements. RAM constantly keeps watch and examines US tax rules and updates the software on a regular basis to makes sure the changes are introduced and applied. Asset4000 automatically computes depreciation for federal and multi-state tax books and integrates individual regulations for each of the 50 states. What Problems Will Asset4000 Solve? A lot of companies are using spreadsheets to manage their assets. This is quite problematic due to human error and lack of audit trail and as the register grows so do the headaches. Also, they do not ensure that companies take the maximum allowable depreciation expense for US Tax purposes. Reporting requirements can be complex but with Asset4000, reports are made easy! The software comes with dozens of built-in reports from any event (additions, disposals, transfers, etc.) to tax worksheets and roll-forwards. Plus Asset4000 has an internal report writer to create user-defined reports. There’s no database coding needed, simply give the report a name and select the column you want! User security is very important, especially with high volumes of users. Asset4000 can restrict what individual users are allowed to see and do in the software. Perhaps users in different locations are only allowed to see their assigned assets or some accountants are only allowed to view internal books and not any tax books. In addition, there is a full audit trail to see what users have logged in and performed. If you are interested in Asset4000 it may also be a good idea to investigate other subcategories of Best Fixed Asset Management Software gathered in our database of B2B software reviews. Every company has its own characteristics, and might call for a particular type of Fixed Asset Management Software solution that will be fit for their business size, type of customers and staff and even particular niche they support. You should not count on getting an ideal software that is going to be suitable for every company no matter what their background is. It may be a good idea to read a few Asset4000 reviews first and even then you should remember what the service is intended to do for your company and your employees. Do you require a simple and intuitive service with just elementary features? Will you really use the advanced tools needed by pros and large enterprises? Are there any particular features that are especially practical for the industry you operate in? If you ask yourself these questions it will be much easier to locate a solid service that will fit your budget. How Much Does Asset4000 Cost? Contact Real Asset Management for information on Asset4000’s basic and enterprise pricing options. You can also submit a demo request to see if the software is a perfect fit for your business. We realize that when you make a decision to buy Fixed Asset Management Software it’s important not only to see how experts evaluate it in their reviews, but also to find out if the real people and companies that buy it are actually satisfied with the product. That’s why we’ve created our behavior-based Customer Satisfaction Algorithm™ that gathers customer reviews, comments and Asset4000 reviews across a wide range of social media sites. The data is then presented in an easy to digest form showing how many people had positive and negative experience with Asset4000. With that information at hand you should be equipped to make an informed buying decision that you won’t regret. Very efficient and user friendly software! What are Asset4000 pricing details? What integrations are available for Asset4000? Asset4000 interfaces with leading finance/ERP systems. Pros: Software is very easy to use and offers a wide range of search criteria for assets. Cons: Calculating depreciation could be a litter faster but is still better than other software I have used. Pros: Easy to locate and track items, ability to dispose of items. financial side is easy to track and dispose of products. Software is very easy to use and offers a wide range of search criteria for assets. Easy to locate and track items, ability to dispose of items. financial side is easy to track and dispose of products. If you need more information about Asset4000 or you simply have a question let us know what you need and we’ll forward your request directly to the vendor.